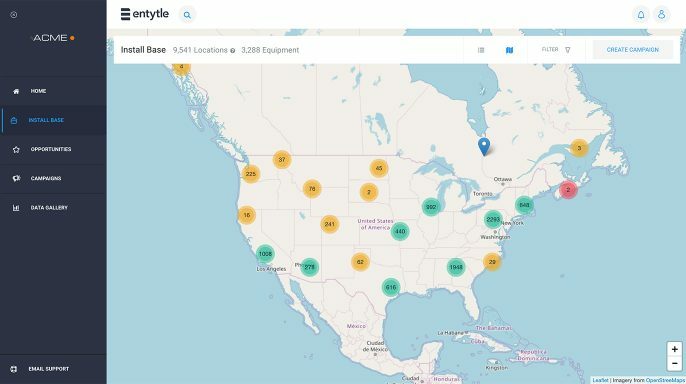 Entytle Insyghts is a SaaS application purpose-built for B2B manufacturers to drive customer engagement and growth for industrial aftermarket services. Insyghts assembles data from multiple, siloed and disparate enterprise systems, and applies sophisticated analytics and machine learning to deliver opportunities for parts and services sales. Insyghts can be deployed in just weeks, with little to no disruption to existing processes and systems. Conventional wisdom says that selling additional products and services to existing customers should be simple and less expensive than acquiring new ones. Yet if you are an aftermarket leader chartered with growing revenue by selling spare parts, consumables and services to your installed base, you know that oftentimes, nothing can be further from the truth. Unlike your colleagues responsible for the initial sale, none of the systems available to you – CRM, Marketing Automation or ERP – provide you with a way of identifying which customers to call, when, for what products, and the reason. Instead, you try to make sense of multiple spreadsheets, cumbersome and conflicting reports, legacy systems, and limited visibility into service and support systems. Entytle Insyghts is the first enterprise SaaS application dedicated to managing and growing installed base revenue. It assembles and processes massive amounts of customer data using sophisticated, purpose-written algorithms to deliver highly qualified opportunities and actionable customer insights. This in turn, enables you to dramatically increase revenue. Empower your entire organization with complete visibility into your installed base. Entytle aggregates and cleanses vast amounts of your ERP, CRM, and other data to provide a true installed base 360° view to all your users. Identify and target customers, run campaigns, manage territories, enable account planning, drive connectivity with customers, reduce churn and re-engage with drifting customers. 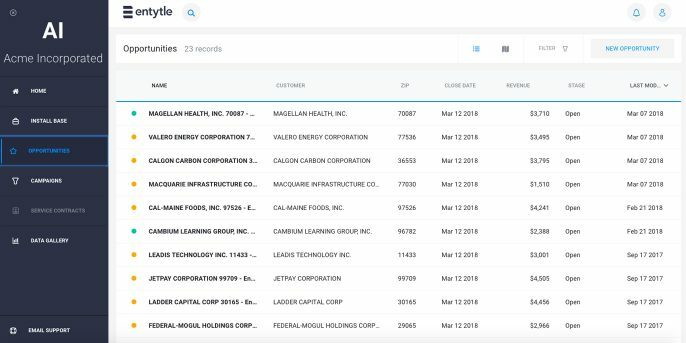 Drill down from a Map or List view to see all account or asset information on one page, including complete order history, service events, service contracts, warranties, open opportunities, contacts, and more. Filter out just about anything to run hyper-targeted campaigns, identify drifting accounts or segment customers based on a multitude of variables. Empower your field staff to edit the installed base, including capturing competitive asset information. Create and manage territories in Entytle. Track account health and nurse accounts back to health with Entytle’s powerful data-science algorithms. Download installed base data for easy offline consumption. Run email marketing and call-down campaigns from Entytle. Use the power of Entytle to segment and hyper-target your customers and exceed your targets. With the power of Entytle, view expected revenue before you run the campaign. Automatically track actuals in Entytle. Easily connect to your marketing automation system. Filter on just about anything to run hyper-targeted campaigns, identify drifting accounts and segment customers based on a multitude of custom variables. Entytle automatically tracks and reconciles orders tied to every campaign, so your actuals vs target is always up-to-date. Ability to connect with any marketing automation system to run email-marketing campaigns. Automatically assign campaign tasks to sales reps and create opportunities upon conversion. View expected revenue, wallet share and other key performance metrics. Do your Sales people know who to call and when? Supercharge your outbound effort with Entytle’s AI-powered Opportunities. Let Entytle’s sophisticated data science and machine learning generate the best and most highly qualified opportunities from your install base. Arm your reps with accurately predicted customer needs and cleansed contacts to drive the highest level of conversion. Entytle’s sophisticated algorithms are constantly running models against your ERP and CRM data, analyzing dozens of parameters that drive customer and cohort behavior and extracts patterns to predict customer needs down to their specific location. Uncover expiring service contracts and warranties in your installed base. Entytle-created opportunities ensure your reps are always on top of every single opportunity in the installed base. Recommended items help drive increased transaction size, by reminding reps to discuss additional items that they may not otherwise. Nothing drives opportunity conversion like accurate contact information. Let Entytle collect, cleanse and rank contacts, so your reps can focus on selling rather than finding the right phone number to call. Available in Enterprise Edition. Entytle verifies phone numbers to maximize rep productivity. Leverage Entytle’s powerful AI algorithms to price your service contracts correctly and confidently, and drive margin. 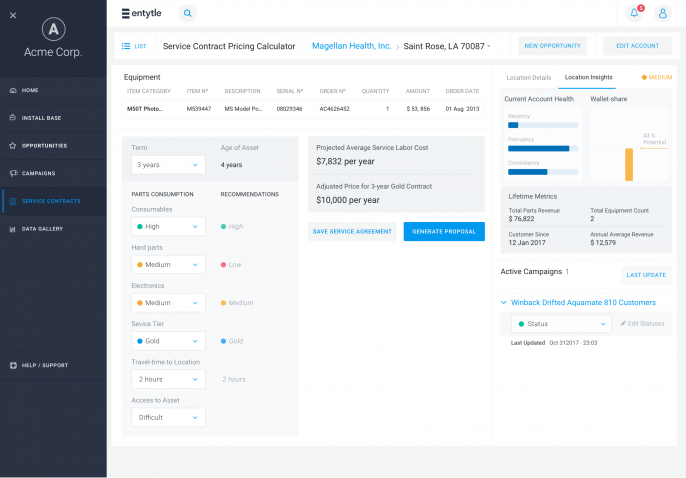 Entytle uses a rule-based pricing system combined with predicted part replacements and service events and labor cost information to make pricing recommendations for your service contracts. Entytle predicts parts replacements and service events based on AI algorithms and uses this information to make pricing recommendations. Entytle uses site and equipment specific configuration information to make pricing adjustments based on rules. Create complex Service Contracts including 4-walls contracts. Specify exclusions within Entytle. Create service contract quotes directly from Entytle. Create completely customizable dashboards in Entytle to drive accountability throughout your organization and provide visibility to execs. 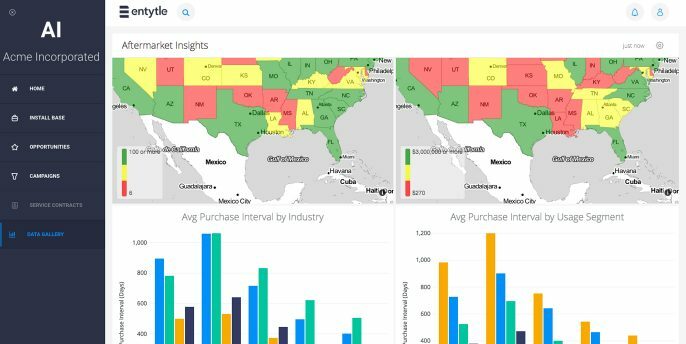 Get actionable business insights and drill into your data from the exec level to the rep level in a few clicks. Visualize your data in any number of different ways, including maps, charts and tables. Track everything about your aftermarket business, your sales team, specific parts or specific geographies, or a particular product line. The possibilities are endless. All dashboards have role-based access control, so your users only see the information they need. Export all the data that you need into PDFs or CSVs. Entytle aggregates your historical data from disparate systems: ERP, CRM, call center, and more. Data is standardized, normalized, cleansed and de-duplicated. Our predictive analytics engine uses sophisticated algorithms to constantly run models against that data, identifying customer and cohort behavior. Entytle AI-driven platform Insyghts predicts customer needs down to their specific location. Highly targeted business opportunities are now available to your aftermarket service, sales and marketing team. Entytle uses secure connectors to extract data from your existing ERP, CRM, service and legacy systems. This data – including orders, contacts, service history, shipping data, and marketing information – is assembled into a proprietary data model where it is swiftly cleansed, normalized and harmonized.